I recently purchased a Monoprice Select Mini 3d printer. I had a rocky start at first, but now it's working great. 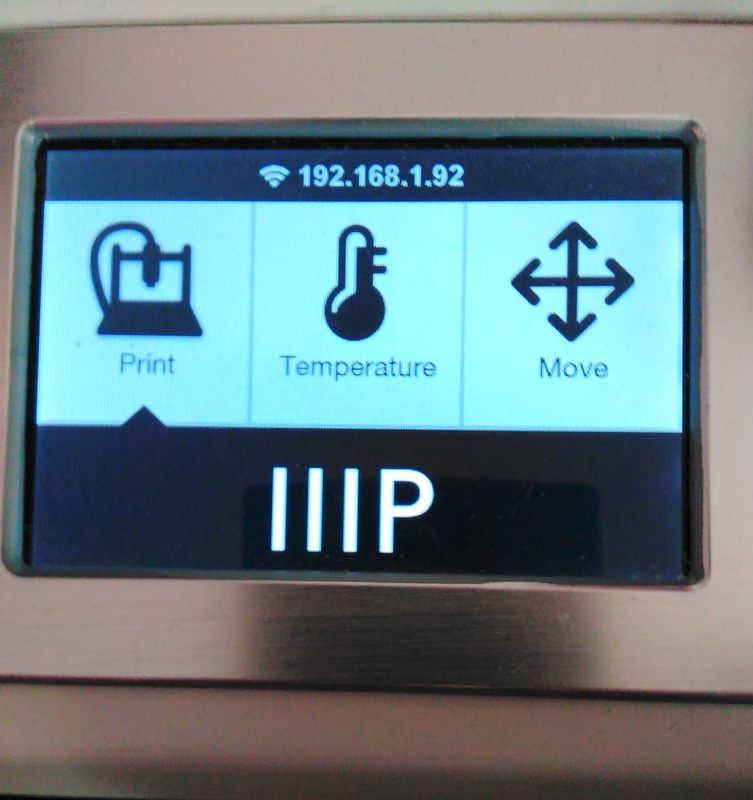 The most important thing to know about this printer is that the best resource for diy support is this Wiki: http://mpselectmini.com. I'd be posting this content there, but registration is closed. On with the show. This printer supports Wi-Fi. It's odd because Monoprice doesn't mention it anywhere in their documentation and their support can't help you with it. In the absence of usable in-one-place instructions anywhere else I'll describe how I accomplished this. First I had to upgrade my LCD firmware. Download the newest version of the LCD firmware from this google drive. Unzip the file and place the lcd.bin file on the microSd card that came with the printer. Stick the MicroSD card in the printer and verify you can see files on the card from the "Print" menu. Push the Print Bed back until you hear it click the Y limit switch. Push the print head left until you hear it click the X limit switch. Press and hold down the knob/button on the printer. With both limit switches and the knob/button on the printer clicked, turn on the printer. The LCD will be black while the printer is updating, and turn on when complete. After the LCD turns on and displays the main menu turn off the printer. Remove the MicroSD card and delete lcd.bin. Next, I had to upgrade the "motion" firmware in the printer. Download the newest Motion firmware from this google drive. Unzip it and copy Update.bin to the MicroSD card that came with the printer. Download fcupdate.flg from the same location and place it on the MicroSD card. From the "Print" menu, select the update.bin file from the MicroSD card. The LCD will display "Updating", and then display the new firmware version number. Next, I had to configure the printer back to factory defaults. Power on the printer and connect it to your pc with a USB/MicroUSB cable. On the Manual Control tab, note the "G-Code" box above the controls. Send the following commands one-at-a-time. Almost done, now we can configure the Wifi! On the Manual Control tab, send the following commands one-at-a-time. Replace "mypassword" with your wireless password. The top line of the printer display should change from "USB Connected" and now display the IP address of the printer. Type the IP address from the printer display into the address bar of your web browser. Click the "Upload Gcode Here" box to upload an output gcode file from Repetier host. Note: The MpselectMini wiki suggests performing a PID Autotune after the factory reset. I completed several prints without doing this and suffered no ill effects. The process is documented here. http://mpselectmini.com/pid_autotune. Tuning the printer's PIDs enables the printer to control the extruder temperature much more precisely, and I did end up running the auto-tune later. I have not noticed any appreciable change in the quality of my prints, but the extruder temperature graph in Repetier Host is now much flatter than before tuning. I can't thank the mpselectmini.com wiki enough. They are the resource for this printer on the internet. I hope this helps someone else.